Many of the photographs on this website can be purchased as high quality, un-watermarked, prints direct from the gallery pages for you to enjoy on your wall. All my prints are free of the copyright watermark you see displayed on images on this website. If you don't see what you are looking for in the galleries, you can use the search facility to search my complete archive. Several sizes are available as fine art prints and canvas prints to suit all budgets. Please note that a degree of cropping to the sides or the top and bottom of some rectangular and panoramic images may be necessary due to the slight variations in the aspect ratios of the images. I am very happy to provide a small sample image showing the final crop before you order if required. Just contact me with the reference number of your chosen image along with the size print you are interested in and I will e-mail back a small jpeg of the cropped image. Custom print sizes are available on request. Each print is made personally by myself in my studio using Epson Ultrachrome K3 ink on Ilford Galerie Gold Fibre Silk paper. This paper is one of the best quality photographic papers available which at 310 gsm in weight has a high quality stiff heavyweight feel with a lustre (semi-gloss) finish. I ensure each print is of the highest quality before leaving my studio. When displayed behind glass and kept out of direct sunlight these prints should resist fading for 100 years. A range of sizes can be directly ordered from my website by clicking on the ‘Buy Print’ button. There are various sizes available for each style of image (rectangular, square and panoramic). 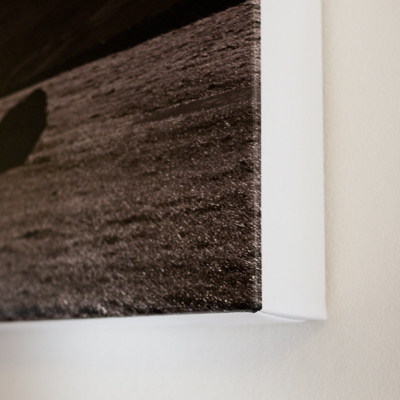 All the rectangular and square fine art prints will fit into standard frames available from many high street-stores. However, to enjoy your print at it's very best I recommend having it professionally mounted and framed. These prints require no glass or frame and are ready for hanging on your wall straight out of the box. 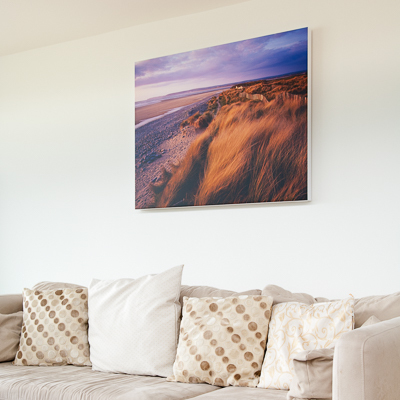 Your chosen image is made into a photographic print on heavyweight canvas which is then laminated to provide a crack free, water resistant, cleanable, scratch proof and UV protection which should last up to 200 years. The canvas then is stretched over a 38mm deep European pine stretcher frame for that high quality contemporary finish. You will be given a choice of a white or black surround. The examples below show my canvas prints with a white surround. Although these prints are exposed, they can be wiped clean and dusted with a damp cloth. Various sizes are available depending on the chosen image. Just click on the ‘Buy’ button to see the available sizes and prices for any given image. Regrettably, canvas prints can currently only be shipped the the UK, Republic of Ireland and the Isle of Man. All my prints are guaranteed to resist fading for many years provided the prints are kept out of direct sunlight and, except for canvas prints, are mounted behind glass. 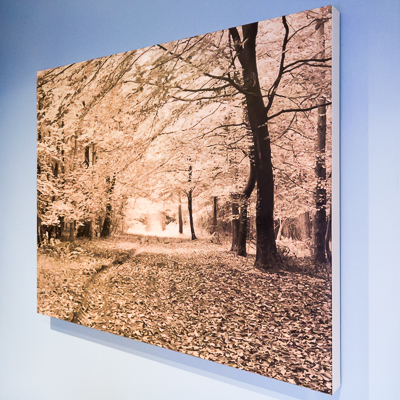 Canvas prints will just need to be kept free of dust with the occasional careful wipe with a damp cloth to ensure the print remains at its best for many years to come. 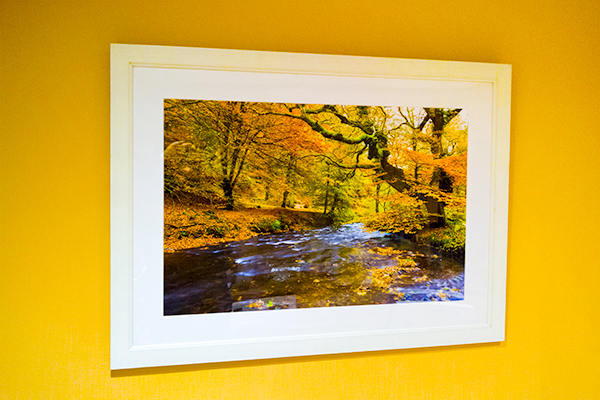 To order a print of an image, click on the ‘Buy’ button on the main image display page. The available print options and their prices will then be displayed in a pop-up window. Select a print product to see the prices. Shipping costs will be shown once a print is added to your shopping cart. Once you have placed your order you will receive an automated response by email confirming the order. I will contact you by e-mail within a day or two of your order to confirm expected shipping dates and I will e-mail you again once your print has dispatched. Orders are usually shipped within 14 days of ordering but in most cases, are shipped much sooner. Fine Art Prints are carefully wrapped in tissue paper and rolled up in sturdy postal tubes dispatched by Royal Mail. Fine Art Prints will tend to roll themselves up for a few days after receipt but will soon flatten out. To avoid accidental damage however, I recommend storing them in their tube until you are ready to frame them. Canvas Prints are shipped direct from by my printing partner carefully packaged in sturdy boxes. I take great care in ensuring my prints are carefully packaged in perfect condition but accidents during transit do occasionally happen. In the unlikely event a print should reach you in damaged condition please contact me immediately and I will make every effort to rectify the damage as quickly as possible at no extra cost to you. Should you have any specific shipping requirements or deadline, please contact me before making your order and I will make every effort to accommodate reasonable requests. Please note that prints shipped to destinations outside the UK may be subject to additional local taxes and import duties when it reaches your country's customs office. How my images are displayed on this website is down to the display characteristics of the device on which they are being viewed. Ambient light can also affect how we perceive colour. Further more, images displayed in the majority of web browsers are not colour accurate. Some colour variation is therefore inevitable and prints may not match the images displayed on your device.